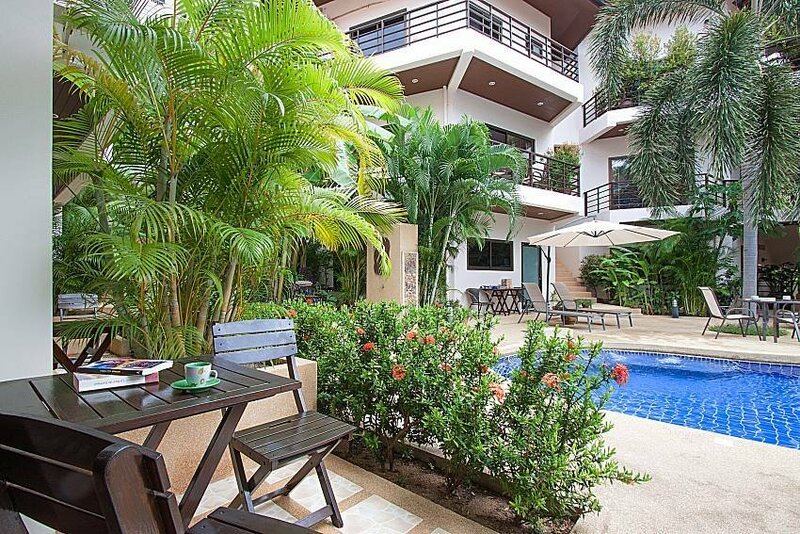 This town-house style villa is situated in a development that is just 300 meters from Chaweng Noi Beach, coming with 24-hour security, secluded gardens and a communal swimming pool and Jacuzzi. There are a total of 5 2-bedroom houses and 4 1-bedroom apartments available for rent. The villa sleeps up to 4 people and offers a modern and convenient holiday experience close to bars, restaurants and shops, all within close proximity to Chaweng, which is known as the epicenter of the Koh Samui tourism market. Sat just footsteps away from the communal swimming pool, you can sit back on your outdoor terrace and enjoy the views, leading directly into the main living area with its wicker furniture and a television with international channels. Within this cozy open plan living space, you will also find a Western-style kitchenette area and a breakfast bar big enough for 4 people. The 2 bedrooms are neat and tidy, with the master having a king-size double bed, while the guest room enjoys 2x single beds, which is perfect for those travelling with children. Both bedrooms have air-conditioning and wardrobes. With the pool being close at hand, and lots of nearby holiday-style amenities just a short walk away, this villa is ideal for those who want to not only be close to the action, but also take advantage of a residential-style atmosphere that is peaceful and modern. This villa rental also offers free Wi-Fi internet, a safe deposit box, daily cleaning services, and fresh towels and bed linens.